Space flight, simulators, astronomy, books, flying, music, science, education: whatever the obsession of the moment might happen to be. 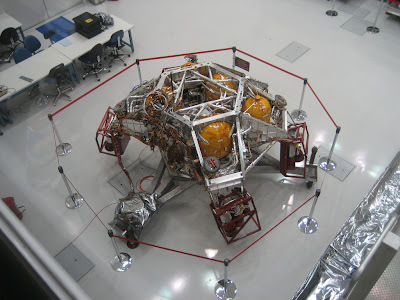 Lest I get too Earth-centric in this blog, I want to mention the progress of MSL (Curiosity to her friends) on Mars. While the JPL team is still taking things slow to make sure everything is carefully checked out, there has been some cool progress, including at least one laser shot and a very short drive away from the landing site. The pictures are amazing, and I think one of the pluses here is that Curiosity's mast cameras are roughly at human eye level, so the perspective is like you would see if you were standing on Mars. While the color photos are great, I'm really digging the sharp B&W shots we've been seeing recently. 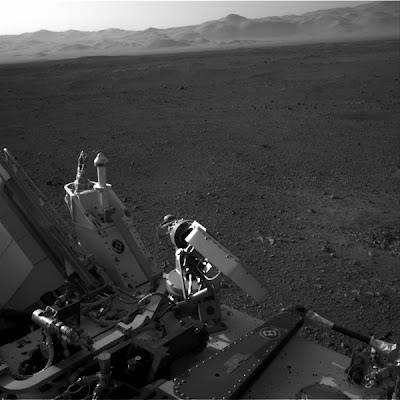 Our own robotic Ansel Adams on Mars. They somehow remind me of beach photos from when I was a kid and my parents took me to Cape Cod. I know, I know. No mountains in Cape Cod. No ocean on Mars. But the look of the B&W just does that for me. Takes me back to 5 years old, playing in the sand with my geological drill and laser spectrometer. 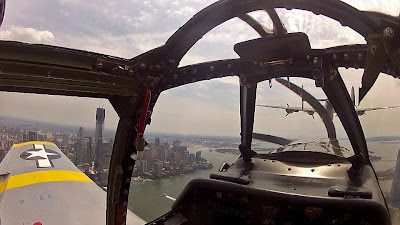 I started to follow the Collings Foundation on Facebook, mainly because they post some of the coolest in-flight photos as they fly their B-24, B-17, and P-51 war birds on their "Freedom Tour" around the USA. Today they posted the wonderful shot below, taken from the cockpit of the P-51 as it flew south along the Hudson River corridor, with Manhattan off the left wing, and a B-24 off the nose (Collings Foundation photo). Last September, I took a flight in the Collings Foundation's B-24 "Witchcraft" when their "Wings of Freedom" tour came to Worcester Airport. Today I visited the Foundation's headquarters for one of their public events, "The Race of the Century." This is a living history of transportation progress in the form of brief races between different vehicles (and sometimes horses and a guy running). The Collings Foundation owns many vintage vehicles and aircraft, from horse-drawn wagons to Stanley Steamers to various aircraft, including a 1909 Bleriot monoplane (this was the type of aircraft that first flew the English Channel). The races and static displays at the Foundation's museum were great, but I paid (quite) a bit extra and took a flight in the foundation's AT-6 Texan. This is the most powerful single-engine aircraft I have ever flown, and I was really only expecting a ride. I was pleasantly surprised to learn that it was technically an instructional flight, and that the aircraft is fully aerobatic, if I was interested in that sort of thing. Well I certainly was! Rob Collings was the pilot (he is the chief pilot and also directs the foundation), and of course he handled the takeoff, aerobatics, and landing, but I got to do some basic flying and some steep turns which were fun. We climbed to 3,500 feet and headed back to the field for some really fun stuff. First a loop, which was amazing. I have only done a few of these in my life and it's always a blast to see the ground coming up from "above" (visibility forward and aft was pretty poor from the back seat, but it was great through the top of the canopy). I love to feel the G-forces too (maybe 2G). We also did a couple of aileron rolls and a barrel roll. Whoopee! I wanted to concentrate on the flying and on enjoying the aerobatics, so I didn't take many photos. The self-portrait above was not taken during a loop (I stowed the camera for that stuff). And I was having more fun than it may appear. More pictures and a couple of videos (Stearman PT-17 takeoff and landing) my Flickr pages. How will the world end? Or at least humanity's part of it? War? Resource depletion? Pandemic? Asteroid? Of course I don't know. I hope we can learn to take better care of this world, and of one another, so we can carry on here for a very long time. I also hope we can develop space settlements similar to what is described in the novel 2312 that I read recently. It would be nice to have an off-site backup for humanity. SpaceX and Curiosity* notwithstanding, that's probably going to take a while. Meanwhile a lot of authors are thinking and writing about the end of the world in one form or another. I have read a fair amount of post-apocalyptic fiction in my time. Not sure why. I like a good story, and I'm curious about how things might turn out if things go bad for a lot more of us than is the case now. In the last two days, I read what may the best post-apocalyptic novel ever (for me anyway). 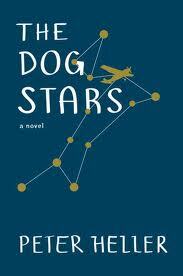 The Dog Stars takes place in an unspecified but very near future, about 9 years after an especially vicious flu pandemic has wiped out over 99% of the human population. It seems totally plausible. The narrator, Hig, lives at a small airport in Colorado. His only neighbor is a heavily armed survivalist, and together they manage to survive the occasional attacks by bands of desperate survivors looking for food and whatever else they can find. They are armed and prepared and they do not negotiate with these people. Hig flies patrols of their "perimeter" in his 1956 Cessna to spot trouble early, while Bangley handles the "ground war." Hig's best friend is his dog Jasper, and with his wife and everyone else he knew dead in the pandemic, his bond with Jasper is an important part of why he is still around. There are some other survivors who live a few miles away, a small group of Mennonites who are infected with "the blood," a wasting disease that is thought to be highly contagious (it somehow became common among survivors of the flu pandemic). Hig lands his plane on their farm sometimes and helps them out in various ways, without direct contact for fear of infection. He is a kind and caring person who is also an excellent hunter, able to take down a deer or a marauding human when the need arises. That sets up the story, and I won't give away any more of the plot details, because it's a great story with vivid characters and a lot of interesting twists (no zombies, no monsters, no space or sciencey stuff, though there is a hint at one point that the virus that wiped us out was engineered in a lab - in California - but no one knows for sure). There's also a fair amount of "flying lore" built into the story which appealed to my pilot side. But the real appeal is Peter Heller's use of language. Heller is a poet who has written a lot of non-fiction. This is his first novel. The writing style simulates to some extent Hig's stream of consciousness, and at first you may be bothered by the lack of quotation marks and other "navigation aids." And also the incomplete sentences and even fragments. But. It seemed natural to me after a dozen or so pages. The real beauty is in how he observes and connects things. He loves the woods, the mountains, the birds, the streams, the sky, everything in nature. And his dog. And his airplane. And his late wife. And poetry. And fishing. Somehow all of these things connect to create a personality that seems vividly real. Hig builds an inner world out of these parts, and you can see why it is worth fighting to go on as one of the few people left alive on earth. But what if one more thing is taken away? I will say that this is the most uplifting post-apocalyptic novel I have ever read. Not a feel-good story exactly. But a tribute to the resilience of the human spirit and to the beauty of the world, in spite of almost anything. Post-apocalyptic fiction for people who don't like post-apocalyptic fiction. Maybe. * This week the Mars Society sent members an email talking about the relatively low cosmic radiation levels that Curiosity has measured in its first first few days on the surface of Mars, saying that this level (about the same as astronauts experience in low Earth orbit) bodes well for human exploration of the Red Planet. 6 More Wheels on Mars! I decided to go to bed rather than wait for Curiosity's planned 1:30 a.m. landing, but without setting any alarm, my wife and I both woke up at about 1:20, and we used the iPad to watch a video feed from the Planetary Society's Planetfest in Pasadena. We tuned in just after cruise stage separation, and both the Planetfest crowd and the JPL control room teams were already going wild. It was very exciting and emotional, and it all went perfectly, including the almost immediate display of a couple of low-res "hazcam" photos showing that Curiosity was indeed safe and sound. Awesome. I was glad I had watched the Eyes on the Solar System EDL simulation earlier in the evening so I could really picture each event as it was called out. We watched for about 20 minutes then went back to sleep. This morning I checked the Planetary Society Blog where Emily Lakdawalla reported that there appeared to be a "puff" of something on the horizon in the very first hazcam image that was not there in a later shot after the transparent lens cover was opened. Her thought was that this might have been a dust cloud from the impact of the descent stage, which was programmed to fly off, run out its fuel, and crash far from the landing site. If so, that would be really cool. Imagery from the Mars Reconnaissance Orbiter will probably confirm that and also show us exactly where Curiosity landed. I've been a very bad Solar System Ambassador the last couple of years. Other parts of life (job, family, music) have intervened, and I just haven't been keeping up with space developments and doing outreach events. My bad. I haven't even fired up Orbiter in probably 9 months. But I'm still really interested in this whole business of exploring the solar system (see my recent review of Kim Stanley Robinson's new book 2312 - he really makes the solar system come alive, 300 years in the future). But of course the solar system is alive now. Mostly here on earth of course, but our latest robotic emissary to a neighboring planet is going to land there in less than four hours from now. That is of course NASA's Mars Science Laboratory (MSL), otherwise known as Curiosity. Today I have been reviewing the mission and the all important EDL (entry, descent, landing) phase, the famous "7 minutes of terror" that will start in just about three and half hours for us (Curiosity will experience it about 14 minutes before we hear about it, the time that light-speed radio signals from Mars will take to get here).